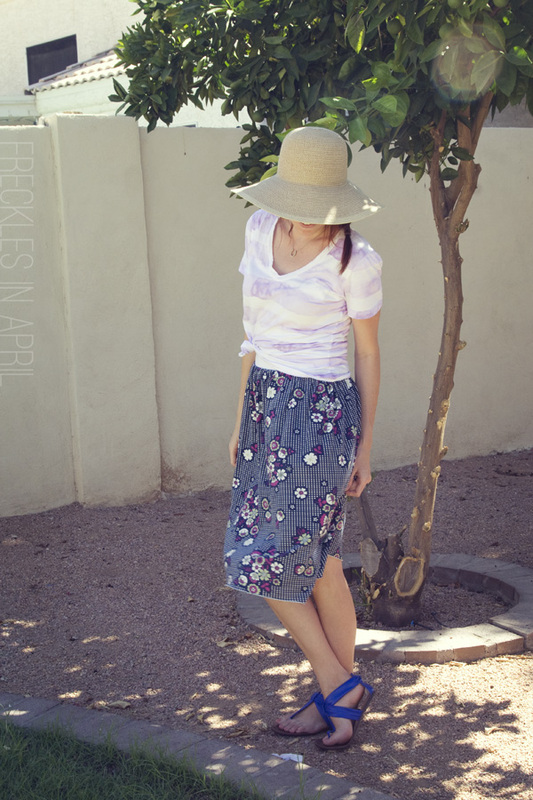 Freckles in April: OTI: Interpreting Grace's Inspiration! I actually have a sweater super similar to Reece's buuuut it's over 100 here so it stayed safely tucked away in the closet. Maybe in the winter I'll revisit this one! I love her look. You could justifiably call cheater-pants on what I chose. I wore it for M:PT but I believe there's a fashion blogger rule that if you didn't blog it then it didn't happen and you're doomed to repeat it. Something like that. But I loved it the first time around and it came immediately to mind when I saw the inspiration, so I don't feel too guilty. I threw this on for the first day of swimming lessons on Monday and was totally patting myself on the back for being all pulled together at 9:20 in the morning (it's rare). And then I discovered that I was supposed to be wearing a swimsuit in order to get in the pool with Baby 2 for his lesson. Lovely. His teacher very nicely took him and used him as the example baby while I sat on the edge of the pool and applauded him for blowing excellent bubbles. Lesson learned. Will be wearing a swimsuit from here on out. Check out Erica's and Grace's interpretations and link up your own below! When are you never not killing these OTI's? Another win. Oh my goodness... hilarious story about the swim lesson!! Yeah, I'm starting to think you're the clothing equivalent to "She could sing the phone book and people would buy it" (yeah, we watched American Idol). You look amazing, as usual. Ah, this look is perfect for this photo! The colors and everything (especially the cute hat!) look great on you! I love the tie dye with the floral pattern! Looks great. Oops on the swimming lesson! But why can't your child always be the example baby? Lol! I love your interpretation! and I agree with Misty ------ he should secure a spot as example babe from now on.